May 29th 2012, 7 p.m. Pieces and arrangements by Gustav Mahler, Alfredo Casella, Anton Bruckner und Sergej Rachmaninov. Marialena Fernandes, Professor of Chamber Music at the State University for Music and Performing Arts in Vienna, was born in Mumbai. Having graduated from the University of Music and Performing Arts Vienna, she has both performed and lectured throughout the world, appearing at prestigious venues such as the Musikverein in Vienna. Alongside her career within the Western Classical Tradition, she has received acclaimed success for projects involving highly innovative concert programmes, integrating a wide range of styles and approaches including classical, improvised, ethnic and contemporary music. Ranko Markovic, Artistic Director of the Konservatorium Wien University, was born in Croatia. He graduated from the Mozarteum University in Salzburg, and completed his studies at the Tchaikowsky Konservatorium in Moscow and in London. He keeps up a demanding international schedule - recent lectures, masterclasses and performances include institutions such as the Musikverein in Vienna, the Philharmony Hall in St.Petersburg and the Shanghai Conservatory. 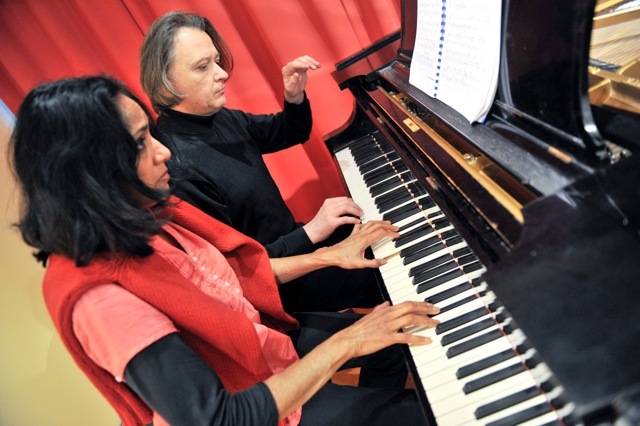 Fernandes und Markovic have been appearing in concert as a four-hand piano duo since 2000. Their international performance schedule is extensive, and they have receiving outstanding critical acclaim for their performances of transcriptions of both Mahler’s and Bruckner’s Symphonies in New York, Canada, Vienna, London, Poland, Italy, Kazakhstan and India. The concert is supported by the Austrian Cultural Forum.